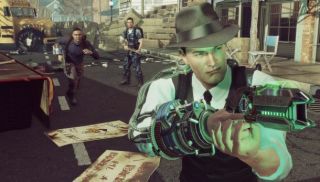 Here's a trailer for The Bureau: XCOM Declassified's 'Battle Focus' feature. From the footage included, it appears a more suitable name would be the "turn it into XCOM: Enemy Unknown" mode. It lets you intersperse your third person shooting with tactical planning, skill deployment, and that shield UI that tells you when you're in cover. It's probably the most like 'XCOM' the game ever looked. "The alternate 1962 universe that we've created for The Bureau is vast and there are many more stories to tell about the early days of XCOM," says development director Morgan Gray. "We're excited that our stories will provide a new perspective on the war effort, much like how our critically acclaimed Minvera's Den DLC for BioShock 2 allowed us to present a unique perspective of Rapture." The bit you are allowed - the actual game of The Bureau: XCOM Declassified - will release August 20 in the US and August 23 internationally.